Bangladesh's Hindus have come under attack as Islamists, angry over the death sentence handed down to top Jamaat-e-Islami  party leader Delwar Hossain Sayeedi by a special war crimes tribunal, engage in a fiery rampage  nationwide. The country's war crimes tribunal  sentenced Sayeedi on February 28, 2013 to be hanged  for crimes committed during the 1971 Bangladesh Liberation War  from Pakistan. 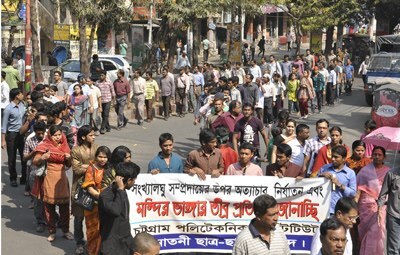 While the verdict was met with cheers from supporters of the Shahbag movement , who have protested for more than a month to demand death for war criminals, the sentence also sparked violent demonstrations countrywide  led by Jamaat-e-Islami  and its student wing, Bangladesh Islami Chhatra Shibir. Protesters attacked police , blocked roads, torched vehicles, and destroyed homes and businesses. The minority Hindu community of Bangladesh, where the majority of the population is Muslim, has found itself  in the group's angry crosshairs. More than 500 homes, 300 temples, and 300 businesses across the country have so far been burned or vandalized, the chairman of Janmashtomi Udjapon Porishad [editors note: an organization of the Hindus, which arranges the Janmastami festivities  celebrating the birth of Lord Krishna], Debashish Palit, said in a press conference  on March 14, 2013 in Chittagong, the country's second largest city. During the mayhem, Dayal Hari Shil, a 60 year old Hindu, was killed  [bn] in the southeastern city of Banshkhali . Bangladesh's High Court ordered  on March 10, 2013 the arrest of those involved in the atrocities in Banshkhali within seven days. The court also ordered the government to ensure the safety of the minorities in nearby Noakhali , which has also experienced Hindu-targeted violence. The brutal attacks directed at the Hindu community are peculiar because Bangladesh's Hindus have no ties to the Sayeedi verdict. 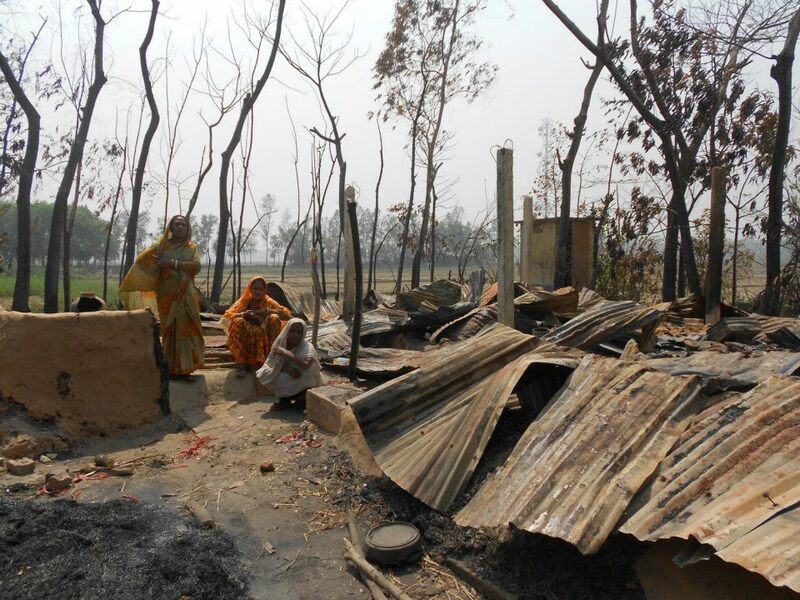 But this is not the first time in the country's history that minorities have been targeted – only recently, a Buddhist community in Ramu  in Chittagong was attacked. Blogger Gita Das , quoting an acquaintance, wrote on blog Mukto Mona (Liberal Thinking) that Hindus are being attacked for the crime of testifying against Sayeedi. Human chain protesting the attack of Hindus. Image courtesy Facebook page I am Hindu . 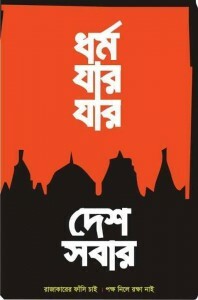 @sabrina_S71 : Save the country from the Jamaat Shibir hyenas. They destroyed Hindu temples. Attacked the Hindu minorities. http://t.co/BOLZ3D5c7H  #Shahbagh .